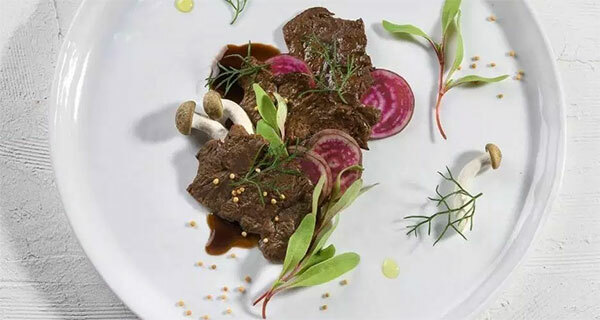 An Israeli food tech start-up has replicated the shape, taste and texture of a conventional beef minute steak with a facsimile grown in a lab from cells. Aleph Farms says its new product demonstrates its capabilities for growing different types of natural beef cells isolated from the cow into a fully 3-D structure similar to conventional meat. The breakthrough, they say, not only obtains the true texture and structure of beef muscle tissue steak, but also the flavour and shape, establishing a new benchmark in cell-cultured meat technology. Cell-grown meat is typically grown from a few cells of a living animal, extracted painlessly. These cells are nourished and grow to produce a complex matrix that replicates muscle tissue. One of the barriers to grown meat production has been getting the various cell types to interact with each other to build a complete tissue structure as they would in the natural environment inside the animal. The challenge is to find the right nutrients and their combination that would allow the multicellular matrix to grow together efficiently, creating a complete structure. The company overcame this obstacle thanks to a bio-engineering platform developed in collaboration with the Technion – Israel Institute of Technology, Haifa. “We’re shaping the future of the meat industry — literally,” says Didier Toubia, co-founder and CEO of Aleph Farms. “Making a patty or a sausage from cells cultured outside the animal is challenging enough, imagine how difficult it is to create a whole-muscle steak. “At Aleph Farms, this is not science fiction. We’ve transformed the vision into reality by growing a steak under controlled conditions. Aleph Farms is implementing a combination of six unique technologies that allow it to drop the production costs of the meat, including innovative approaches related to an animal-free growth medium to nourish the cells, and bioreactors – the tanks in which the tissue grows. “Aleph Farms’ minute steak is thinly sliced and will cook in just a minute or so,” says Amir Ilan, chef of the restaurant Paris Texas in Ramat Gan, Israel. “For me, it is a great experience to eat meat that has the look and feel of beef but has been grown without antibiotics and causes no harm to animals or the environment.